It looks like the Canadian economy has run over the cliff; all that remains is the fateful moment when it is time to look down. The February Labour Force Survey was at best mediocre, but the ugliness lies in the details. Over the past year, 130 thousand jobs were created (a 0.7% annual growth rate), but 43% of those jobs (56 thousand) were in the Construction sector. The travails of Canada's oil and gas sector are highly publicised, but the collapse in construction employment is what will cause Canada to replicate the United States' downward spiral in the last recession. There are have been previous dips during the cycle, as the data are somewhat noisy. And as I can personally attest, this winter has had unusually horrific weather, even by Canadian standards. Therefore, we would need to see a longer run of data to conclude that the end has been reached. One common reason that I have seen floated to justify the exuberance in residential starts is that it has slowed to be close to what is seen as the "steady state" rate of household formation. Unfortunately for that theory, this steady growth of household formation requires a steady growth in jobs for people have not yet formed households. The experience in the United States shows that realised household formation falls short of what is predicted by demographics if the labour market goes over a cliff. I should note that a total collapse of the Canadian economy is not inevitable. There could either be a miraculous improvement in foreign demand for Canadian exports, or else fiscal policy tightening could be reversed. That said, I am not seeing a lot of catalysts for improvements in the outlook beyond the ongoing rout in the Canadian dollar (which will damage net exports in the short run due to the "J-curve" effect). A tale of 2 economies: Making sense of U.S. and Canadian labour market data - Louis-Philippe Rochon, for CBC. Summary: the data are terrible on both sides of the border. 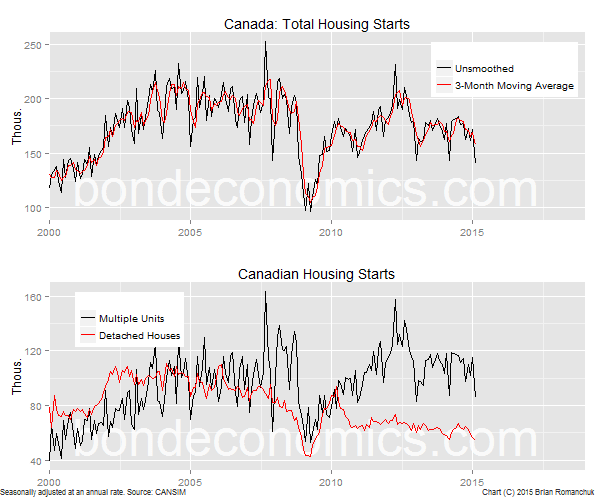 Explanation of my structural views on Canada - Why The Canadian Economy Is Doomed.